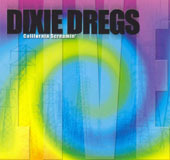 The Dixie Dregs evolved from an Augusta, Georgia band called Dixie Grit, formed by Steve Morse and Andy West in 1970. The band featured Morse’s older brother Dave on drums, Frank Brittingham (guitar and vocals) and Johnny Carr (keyboards). Carr was later replaced by Mark Parrish. Shortly after Steve Morse’s enrollment at University of Miami’s School of Music in 1971, Dixie Grit was disbanded. Morse and West continued performing as a duet, calling themselves Dixie Dregs (the “Dregs” of “Dixie Grit”). In 1973, Steve Morse (guitar), Andy West (bass), Allen Sloan (violin) and Bart Yarnal (drums) met while students at the University of Miami’s School of Music to play as Rock Ensemble II. West also attended Georgia State University for a year while studying cello and music theory & composition along with Parrish. Parrish remained at GSU during the academic school years only to return to Augusta, Georgia during summer breaks – re-establishing the guitar/bass/keyboards/drums quartet with Morse, West, Parrish, and Gilbert Frayer (drums) performing as opening acts for concerts and headlining local gigs as the Dixie Dregs. During subsequent academic school years, the remaining members of the Dregs — including Andy West — returned to the University of Miami and Mark Parrish returned to Atlanta, Georgia to complete his degree in music performance and composition at Georgia State University under the study of William Masselos, with additional studies of electronic music at Columbia University in New York City under Alice Shields – a protégé of Wendy Carlos. All About Jazz musician pages are maintained by musicians, publicists and trusted members like you. Interested? Tell us why you would like to improve the Dixie Dregs musician page.